The weather this week was a revelation. I am writing this from my apartment, whose windows are wide open and letting an unseasonably cool breeze blow inside, thus reminding me that fall will be here before we know it. And this year, dear readers, I intend to buy a leather biker jacket. Not a black one—I am by no means edgy enough to pull one of those off. 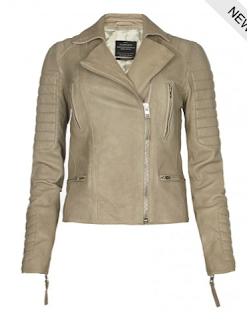 But I think this AllSaints sage leather biker jacket is just the right amount of cool. The color is somewhere between green and gray, which is much softer and more accessible than black, plus you can wear it with pretty much any other color, since it's still a neutral. It's made of supersoft lambskin, and AllSaints tends to cut their jackets very well with high, snug armholes and slim fits through the body. Of course, a great-fitting lambskin jacket is definitely a piece that requires a bit of investment, and while this one is a fraction of what a similar style by, say, Balenciaga or Rick Owens would cost, it's nothing to sneeze at. Still, I may just treat myself. If this glorious weather sticks around, I may need it sooner rather than later!